We are Nottingham’s original roller derby league, and we’ve fallen hard for skating and the brilliant sport that is roller derby. We train hard and laugh a lot. 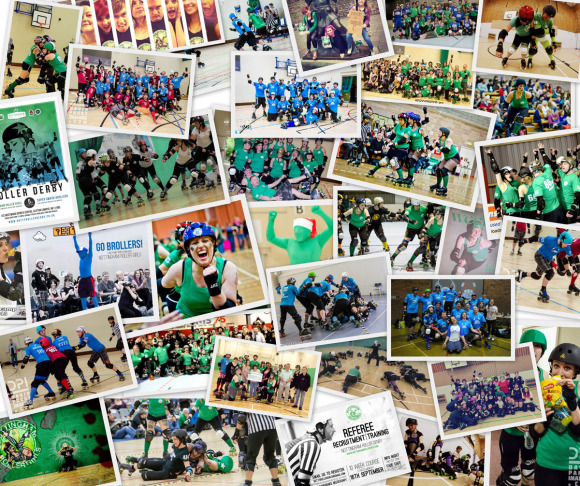 We’re lucky to have a great team of experienced coaches keeping us all on the path to derby awesomeness. We currently have three competing teams within our league: Nottingham Roller Girls A and B teams (for female identifying players) and Super Smash Brollers (predominantly for male identifying players). We have separate training days to focus on each team individually but on a Monday our practice is for all-genders where we train and scrim together. We also have a mix of people who coach, NSO and referee. We are big fans of all-gender games, we even hosted UK’s first mixed game in 2011! We have a fledgling ref crew which, thanks to our referee intake in September 2013, has grown from zero to quite a few dedicated refs with great ambition. We are excited to be part of the wider UK roller derby community and make every effort to support our local leagues where we can. Every year we ask our members to nominate a charity. We raise money through events and donations at game days. We also give back in other ways; NRD has a volunteer coordinator so that members can give their time to help charities at events. We’re also incredibly proud of Roller Derby Donors – founded by one of our members, which encourages the derby community across the UK to donate blood. For 2017/18 we supported Burton Wildlife Rescue and The Linjoy Sanctuary. Based in Burton, they care for injured wildlife and aim to rehabilitate and return them to the wild. Where this is not possible they offer sanctuary to those animals that can live happily in captivity with a good quality of life. Our 2016/17 charity was Mind; supporting people with mental health problems and raising awareness in the wider community. In 2015/16 we supported Brake, who work with communities and organisations across the UK to stop the tragedy of road deaths and injuries, make streets and communities safer for everyone, and support people bereaved and seriously injured on roads. In 2014/15 we raised money for Equation, a Nottingham based charity who help prevent and respond to domestic violence – we managed to raise £1,427.00.